The sales building (“Marketing Suite”) for the new housing development beside the Racecourse Park was originally intended to be repurposed as a community facility. Fingal is now undertaking a consultation in relation to the overall community needs in the area and the feasibility of using the now damaged building. The Community Development Office of Fingal County Council aims to strengthen communities by helping to establish and support local community groups and activities across Fingal. We would like to hear the views of residents and community groups in Baldoyle to assist us in establishing needs in the area in terms of community and social activities, leisure and sporting facilities. We are also interested in your views on the potential development of the Menolly Marketing Suite Building at Red Arches as a community facility. You can give your views by completing an online survey and/or by attending a public meeting. Online survey: Visit https://consult.fingal.ie/en/surveys and complete the online survey between 16 October and 16 November 2017. The online survey can also be completed at Baldoyle Community Hall, Main Street, Baldoyle. Public consultation meeting: A meeting will be held at 8.15 pm on Wednesday, 1 November in Baldoyle Community Hall, Baldoyle Forum, Main Street, Baldoyle. This entry was posted in Baldoyle / Baile Dubh Ghaill on October 24, 2017 by david. Design work is starting on the section of the coastal greenway beteen Sutton and Malahide. The consultants have been given a brief to produce a high quality amenity greenway along the coast. It will be part of the Fingal Coastal Way, leading on from the Sutton to Sandycove route around Dublin Bay, and connecting to the route across Broadmeadow Estuary from Malahide to Donabate. 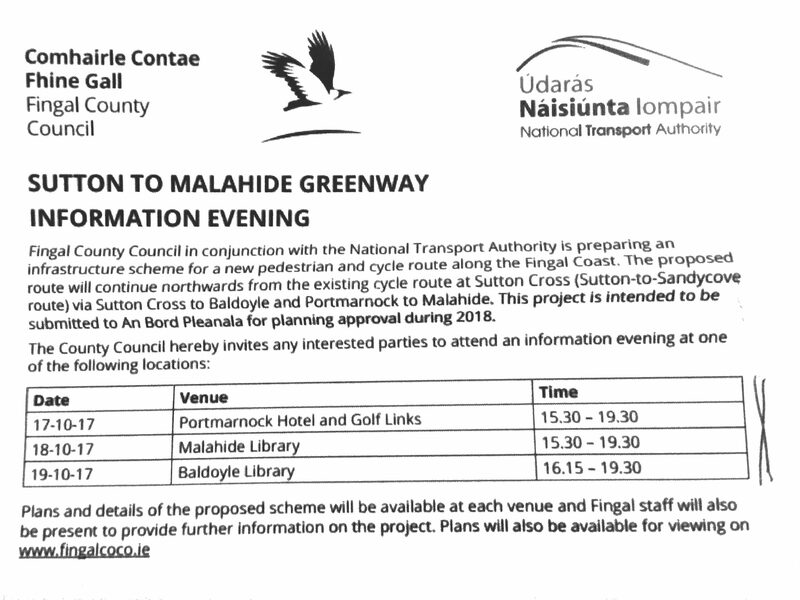 The Baldoyle to Portmarnock section was taken first and is ready to go to An Bord Pleanála and formal public consultation, probably in October. -from the Sluice River south of Portmarnock to the railway line at Malahide Estuary. The purpose of the information meetings is to set out the scope of the project and to start the discussion with local people and visitors of the issues, challenges and opportunities in designing the Greenway. All are welcome. This entry was posted in Baldoyle / Baile Dubh Ghaill, Malahide/Mullach Íde, Portmarnock/Port Mearnóg, Sutton/Cill Fhionntain, Transport / Taisteal on October 9, 2017 by david. This entry was posted in Water / Uisce on October 9, 2017 by david.